This year, the company Froiz celebrates its 50th anniversary, having offered its clients the best quality at the best prices since it was established. Froiz is a company dedicated to the sale of food products, though its commercial network formed by 242 points of sale divided between supermarkets, hypermarkets and Cash & Carries. 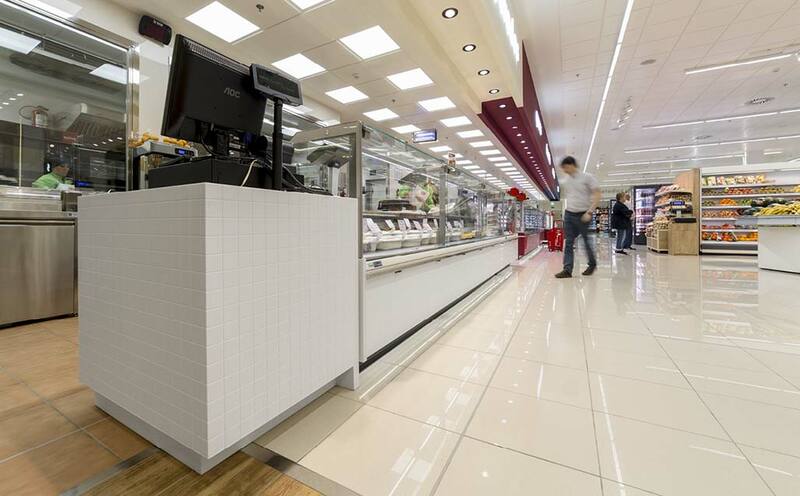 We can find the solid surface from PORCELANOSA Group, KRION, in the refrigerated and ready meal area. The combination of colours 1100 Snow White and 6405 Happy Red provide a contrast generating tranquillity and wellbeing, two emotions that customers seek and which Froiz conveys in its spectacular supermarket in Fuenlabrada, Madrid. The recently established transforming company Encidecor was entrusted with creating this project using KRION, with the characteristic of having machined the material to emulate a ceramic mosaic with a spectacular result.